This handcrafted cherry wood tool helps you check on treats without burning your fingers. 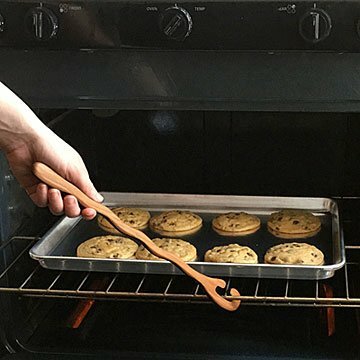 If you love to bake, grab this handcrafted kitchen tool. To check on whatever deliciousness you have in the oven, slip this hook over the end of the oven rack and pull. It will hang on, hands-free, until you're ready to push the rack back into place again. Hand carved from cherry wood by Jonathan Simons, the rippling handle is beautiful even on display, and it makes a great kitchen conversation starter, as well as an unforgettable housewarming or hostess gift. Handmade in Kempton, Pennsylvania. We bought one for home. Being snowbirds, we brought it with us to try on our very small gas oven here. The shelves are not easy to move. It works perfectly so we purchased another one. Having MS, which limits my hand usage and inability to tolerate oven heat, this rack pull and push allows me more independence. Thank you so much for a beautiful and attractive tool. I am 100% happy with this product. Never thought I would find an item like this to help my daughter with her fear of ovens. Quality wood, crafted with great skill and care. Perfect gift for my friend who burns herself cooking more often than you can imagine. Even with oven mitts she manages to hurt herself, so this rack puller was practically made for her! Quality smooth wood, easy to hold and store. I'm thrilled with the purchase and she was happily surprised to receive it! Love this gadget. I love to bake and this item works great. I was constantly reaching inside my oven and burning myself. Even though I have only used this pull once, it works great and I will be using it a lot in the future. Great little tool to have!